As we learned last month, Sony Pictures Classics just recently picked up Foxcatcher, the new drama from Capote and Moneyball director Bennett Miller, and gave it a prime awards season release date of December 20th. Then the first photo of Steve Carell surfaced with the actor in full make-up and wardrobe as John DuPont, the real-life chemical heir who befriended brothers Mark (Channing Tatum) and David Schultz (Mark Ruffalo), a pair of Olympic wrestlers, before murdering the latter sibling in 1996. Now two new photos show Tatum sharing a tender moment with Ruffalo and getting coached by Carell. Foxcatcher is directed by Bennett Miller (Capote, Moneyball) and written by Dan Futterman (Capote, "In Treatment") and E. Max Frye ("Band of Brothers"). 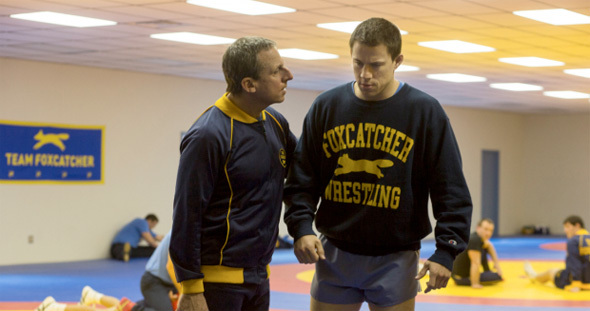 The film tells the gripping, true story of Olympic Wrestling Champion brothers Mark Schultz & Dave Schultz (Channing Tatum and Mark Ruffalo) and their relationship with eccentric John du Pont (Steve Carell), heir to the du Pont Chemical fortune, that led to murder. Sienna Miller, Vanessa Redgrave and Anthony Michael Hall also star in the film which Sony Pictures Classics releases in the heart of awards season on December 20th, just before Christmas. Well? Should be coming soon. These photos usually precede the trailer in close proximity.